One Handed Cooks (Allie Gaunt, Jessica Beaton and Sarah Buckle) have just announced their debut cook book. ON SALE in all good book stores from August 1st 2016. We promised you that there was something wonderful in the works and now we can finally reveal it. This book, published by Penguin Random House Australia, is so much more than the amazing new recipes (over 100! 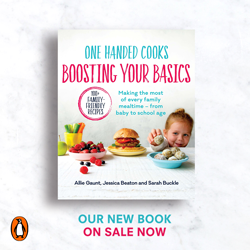 ), the One Handed Cooks book is filled with some of the most up-to-date and practical information for parents and carers. Offering real, practical advice on all areas of feeding from baby to school age, that we hope you will refer to time and time again. We wanted this book to take parents on a feeding journey, from starting solids to finger foods and introducing family foods. We have included all of the frequently asked questions and troubleshoot many common fussy eating and feeding problems before they happen. This is every parents go-to guide for feeding children. ‘Raising a child who has a healthy, positive relationship with food – who enjoys mealtimes, is adventurous and enjoys a wide variety of foods, and who understands basic nutrition – is every parent’s dream.’ - Excerpt from the book. 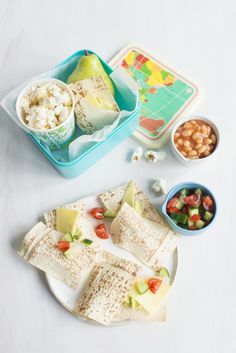 Simple, nutritious and tasty recipes for babies through to school-aged children, including meals that the whole family can enjoy, as well as a wealth of information on how to raise a healthy eater. Giving your child the best possible start in life includes the food you offer them every single day. 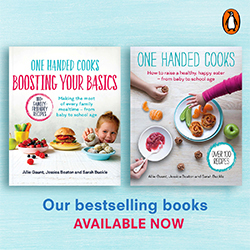 One Handed Cooks: How to raise a healthy, happy eater provides simple recipes that are enticing, varied and highly nutritious, as well as plenty of practical advice to help you successfully navigate your child’s journey with solid foods. Learn how to avoid the trap of fussy eating, and ways to manage the common challenges that parents face, from spoon refusal to teething issues, throwing food and gagging. 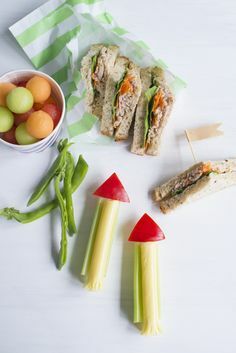 Above all, learn how to set your child up with a positive relationship with food and healthy eating habits that will last a lifetime. Allie Gaunt – Formerly a professional nanny and advertising copywriter, Allie created the hugely successful One Handed Cooks blog in 2012. Allie is passionate about feeding children nutritious, homemade food and making mealtimes happy. Jessica Beaton – Jess is an Accredited Practising Dietitian with 15 years of evidence- based training and experience. Jessica is a keen cook with a passion for simplifying the science to educate parents in a friendly and practical way. Sarah Buckle – Sarah is a dedicated primary-school teacher with a passion for baking. 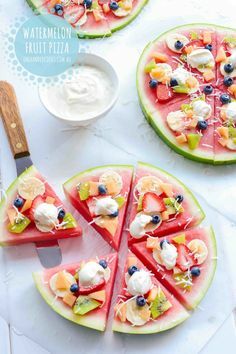 She is the photographer and food stylist for One Handed Cooks. Just purchased your fantastic new book!